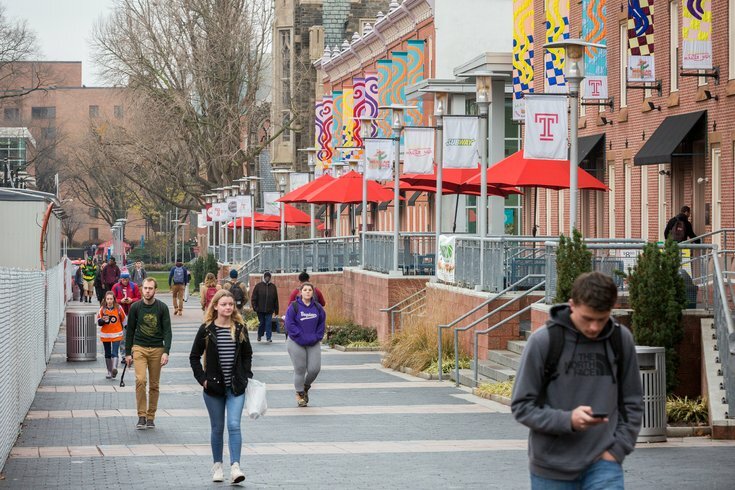 Students walk along Temple University's Liacouras Walk. Twenty-one-year-old Temple University student Daniel Duignam was found dead in his off-campus apartment Saturday night, the university announced in a statement. Duignam, a Northampton County native and third-year business student, was discovered with gunshot wounds in his apartment on the 1700 block of Diamond Street, prompting an investigation from Temple and Philadelphia Police. Police don’t believe the incident to be a random act. According to police, Duignam was shot three times just after 9 p.m. Saturday night. He suffered gunshots in his stomach, right arm, and face and was pronounced dead in the apartment. Temple President Richard M. Englert said in a letter to the community that “there are many questions yet to be answered” and the campus will have enhanced patrols as the investigation unfolds. This is the sixth reported death of a Temple student this academic year. In November, 24-year-old Michael Paytas was found unresponsive in the campus library and later pronounced dead. Just a few days later, in early December of last year, Temple junior James Orlando was found dead from a drug overdose in his off-campus apartment. At the start of the school year, 22-year-old Jenna Burleigh was reported missing and later discovered dead after suffering blunt trauma and strangulation. In early October, 19-year-old Richard Dalcourt died after falling from his dorm room window at Temple. About a week later, 22-year-old student Cariann Hithon was fatally shot by police after she crashed into a detective’s cruiser during a visit to Miami. As the series of deaths has garnered backlash from students at the university’s counseling services, Englert urged students to seek help during emotional or highly stressful times through the campus’ Tuttleman Counseling Services, which will be open Sunday afternoon. No weapon was recovered and no arrests have been made. Anyone with information is urged to call 215-204-1234 or to use the confidential tip line at 215-204-6493.